Why Do Vegetables Go Limp? Do Frozen Raspberries Have Less Fiber Than Fresh? Freezing fruits and vegetables soon after they’re picked locks in some of the nutrients so they stay healthier for a longer time. 1 Is There a Loss of Nutritional Value in Frozen Blueberries? 3 Why Do Vegetables Go Limp? 4 Do Frozen Raspberries Have Less Fiber Than Fresh? What’s nutritionally better for you than a carton of fresh berries hand-selected at your local Whole Foods or farmers market? A bag of the same berries from the frozen-food aisle of your nearby grocery store, according to research from the University of California, Davis. Most frozen vegetables and fruits are blanched — briefly cooked in boiling water — before they’re frozen to maintain quality, according to the U.S. Food and Drug Administration (FDA). Despite this process, however, frozen produce has long been touted as nutritionally equivalent to the fresh stuff. That’s in part because fresh fruits and veggies often spend so much time in handling, shipping and storage, and by the time they reach your kitchen, their nutrients have taken as much of a hit as from the processing required for freezing, past research has found. And that is why this particular study from the University of California, Davis, is so fascinating: Researchers wanted to take out the variability of shipping and handling to determine the exact effect of the freezing process on the nutrients in fruits and veggies. To do so, they grew their own produce and then assessed the nutritional content of the fresh stuff immediately after it was picked versus after it had been blanched and frozen. The study looked at vitamin levels in peas, green beans, broccoli, spinach, corn, carrots, strawberries and blueberries. Specifically, they looked at vitamin C and riboflavin (both of which are very susceptible to temperature) as well as vitamins A and E (which are vulnerable to oxidation, or air exposure). Nutrient levels were measured within 24 hours after harvest, and again three to 10 days later for fresh fruits and veggies and 10 to 90 days for frozen ones. Conclusion: “Your freezer is your friend,” says Brissette. Frozen vegetables and fruit can help you save time and simplify meal prep, since you don’t have to wash, peel or slice them. What’s more, frozen produce is kind to your wallet because you can stock up when it goes on sale and waste way less money on spoilage. In fact, research has found that 40 percent of the food in the United States goes uneaten, while the average four-person American family wastes about $1,500 on food every year — mostly on edibles gone bad in the fridge. Frozen veggies are a fast and easy way to add bulk and nutritional punch to your meals. Brissette says she always has frozen berries, mango, spinach, kale, stir-fry veggies, herbs, garlic, ginger, whole-grain bread and large bags of nuts and seeds in her freezer. Kale is perfect for smoothies, pasta sauce and soups, while spinach is great in frittatas, quiche and lasagna, she says. 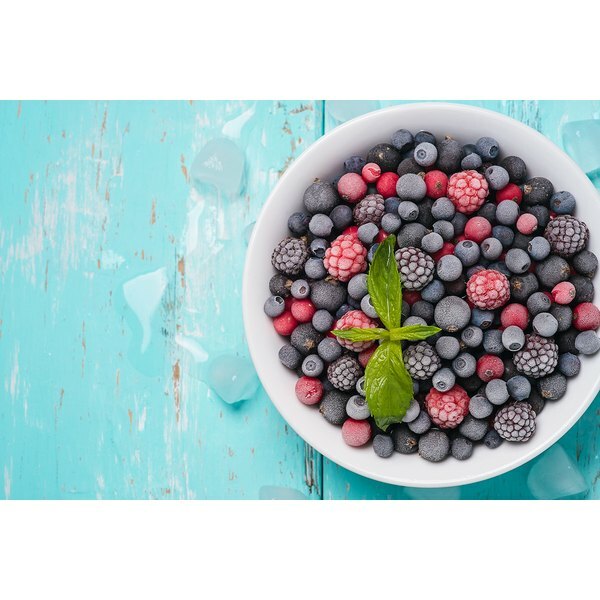 Frozen berries and other fruits are best in smoothies, yogurt, oatmeal and cobbler. When choosing frozen produce, check the label for an organic certification (this is good) as well as added salt, sugar and preservatives (these are bad). The only ingredient listed should be the veggie or fruit. Also keep in mind that frozen fruits and veggies don’t last forever. While freezing slows down the work of the naturally occurring enzymes trypsin and chymotrypsin, these enzymes as well as oxidation still chip away at the quality of frozen produce over long periods of time. Brissette likes to keep frozen foods for about nine months, but says they’re usually good for up to a year. Not sure how long that broccoli has been sitting in there? Check for expiration or best-before dates; if it’s come and gone, the flavor, texture and nutrition aren’t at their best. Do you have frozen fruits and vegetables at home? Does it help you cut down on food waste? What recipes do you make with frozen produce? Let us know in the comments!